Tuesdays are nights of intense competition. Not only does my team, The Mighty Tucks, square off against our arch rivals, Boats and Bottom Hunters, in trivia night at the local bar, Friar Tuck, but I’m also engaged in fierce hand-to-ball combat bumping, setting and spiking my way through Chicago Park District volleyball at Welles Park. Let’s get one thing straight — I love volleyball. Let’s also get another thing straight — I’m not very good at volleyball. But the spirit of fun and the drive to get out and do something and meet new people made all twelve of us who signed up show up at the park July 3 in 95-degree heat to play for a while. At first, I told my friends Welles Park volleyball harkened back to the fun times of gym class. But then they reminded me that gym class was, in fact, not very fun, so I harkened forward a bit, to intramural volleyball in college. Under the guise of competition, a dozen of us showed up to play a lighthearted game with our friends and maybe even learn a little about proper hits. 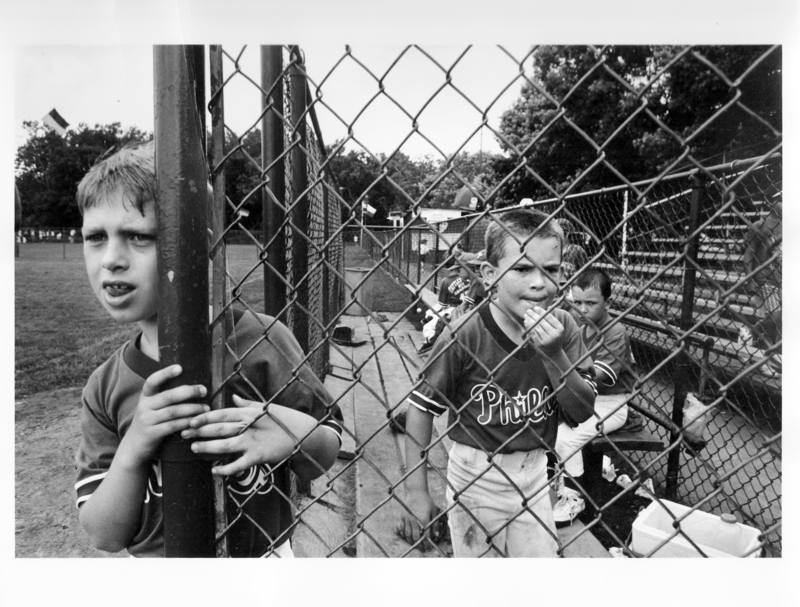 Two young sluggers at Welles Park circa 1990 — myself and my childhood friend Tommy. Some occurrences in life really make me think that life comes full circle, because the last time I regularly was showing up at Welles Park — also for a sport where winning or losing made little difference — was around 1990 when I played t-ball. I played on a team with my best childhood friend, Tommy, that was coached by his stepdad. It’s funny, though, how much emphasis was placed on a sport where little kids hit a stationary object off a plastic tube. Every team in the league not only wore t-shirts with their team’s name on it (we were the Phillies), we also were outfitted in baseball pants and color-coordinated stirrup socks. At five years-old, I was the most professionally uniformed of my athletic life. And that made victory taste all the sweeter when our team took first place in the tournament and was featured in the cover story of the Chicago Reader (which my dad worked for at the time, but I don’t think he influenced any coverage. At least not that I know of…). The plastic trophies still sit in my basement. My coworker Michal and I recently were watching kids run around in the fountain in Millennium Park and she wondered what it would be like to view the world as a child again. It made me think about my own childhood growing up in the city and how I perceived the world. I remember my life not laid out on a map, unable to see how everything fit together, but instead only recognizing the pieces of the puzzle. I remember Welles Park. I remember going to preschool at Queen of Angels. But I don’t remember that the two were a block apart. I remember my old house and I remember going to the Montrose park house, but I never realized how close they were together. Now that I’ve moved back to the city I’m able to fill in the puzzle between the individual pieces. But something else has happened, too. After not having grown up in these places and suddenly coming back to them after 15 years, I’m able to recall what it was like going to preschool or winning the t-ball championship. It’s like those perceptions of childhood were frozen in time after moving out of the city, the memories preserved. And now, once again, I feel like a kid every time I go to Welles Park. Except this time I’m not wearing a uniform.